Over-cluttered and under-produced, The Sullen Route's latest album doesn't really hit any sweet spots. I have to confess that I had that all-too-familiar sinking feeling when I first read some of the track names on The Sullen Route's album 'Last Day In Utter Diseases', not to mention the album title itself. I almost think it works to the band's advantage that they've opted to not put their lyrics in the inlay because I'm a bit of a stickler for that. I guess I just don't understand why bands won't write songs in their natural tongue but perhaps that's just me. Russia's The Sullen Route claim to deliver Melodic Death/Doom / Progressive Rock on 'Last Day In Utter Diseases', which I suppose is technically correct but it's not music that I'd really want associated to Death/Doom, to be frank - I'm quite happy to let Progressive Rock "claim" this one. Curiously, the introduction on this album reminded me a little bit of a wildlife documentary starting up more than either of the aforementioned tags though! Honestly, with the hooks they've produced on this release, I'd be extremely interested to hear the band record Ambient music - I think they'd do it really well. Still, The Sullen Route have opted for Doom Metal, so they shall be judged as such here. My first impression of them doing that was, "God, this is bad". I promptly gave myself a bit of time to further listen to their Doom tracks though, just in case I was jumping the gun. My assessment has remained the same, I'm afraid! Firstly, the production is a bit poor for me. I think everything sounds too low in the mix, especially from an instrumentation perspective. Secondly, I think that the vocals are more shouted than growled, which doesn't really suit the style that the band have opted for. Thirdly, there are some very bizarre interludes during tracks that remind me more of background music at media conferences than serving as a complement to the music. Fourthly, the male clean vocals sound like somebody got drunk and seized a microphone in a karaoke bar. I wish I could say that it's just me being unfamiliar with cleanly sung Russian vocals but no, I actively listen to Krynitza and I enjoy what they do so I can only assume it's a combination of both the production and the band's choice of vocalist. Lastly, the song structures sound all over the place as the band repeatedly opts for intensity and randomness over consistency and preparation. Honestly, I think the release is a bit of a disaster, and that's me putting it very kindly. I've got too many comparisons running around my head than I can possibly list here so I shall simply say that anybody who has ever listened to Melodic Black Metal band Cryptic Wintermoon will find a Death/Doom equivalent in The Sullen Route. The differential is that Cryptic Wintermoon had a bit of a laugh on their releases, and they took themselves as a bit of a joke - or at least that's the impression they always conveyed. The Sullen Route have all of the same joke, Core-esque elements but seem to take themselves seriously, which I find rather incredulous. I'm trying to find something positive to say about this album but other than the Ambient hooks (which I like, in a strange sort of way) and the female clean vocals (she reminds me a little of Kari Rueslatten) there's nothing good to say. It's like this band has somehow managed to fuse pretty much everything that I dislike in music and somehow compressed them into one album. 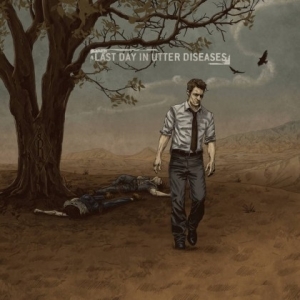 I genuinely cringed when listening to 'Last Day In Utter Diseases', and I'd find it most agreeable if I never heard this album again. Simply put - too many styles, too many ideas, poor production, poor execution, painful to listen to. Visit the The Sullen Route bandpage.